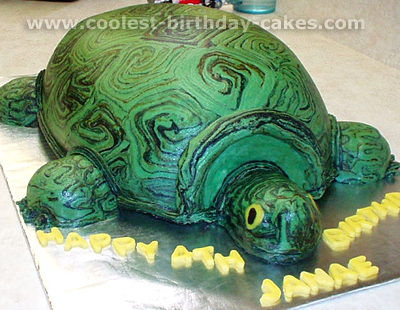 This sea turtle cake was made for a "sea turtle lover who doesn’t like sugary sweet cakes". The body was baked in a tin turkey roasting pan. It gave the perfect shape and popped out of the pan beautifully. The legs were cut from 8in round cakes (the front legs have a perfect angle if you allow the cake to rise in the middle then use the high sides next to the body) and the head from layered leftovers. I used butter cream frosting tinted sea foam green all over. The eyes were raisins and the shell fresh fruit. 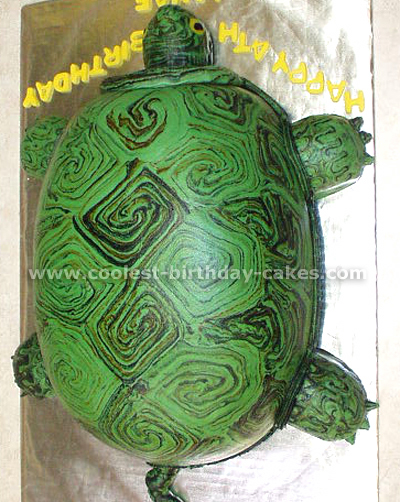 Hints: Don’t decorate the shell until the last minute unless you can refrigerate the cake! The fruit will start releasing its juices and run all over the place. It helps to glaze the fruit after placing and if you must transport you can place paper towels all around to soak up any juice. This is one of my more unique cakes if made and it’s not perfect but everyone loved the design and the fresh fruit. I made this cake for my nephew’s first birthday. I first baked a cake for the body in a Pyrex baking bowl, then for the head I made a bowl out of tinfoil the size I wanted and I made cupcakes for the legs. I decorated with the star tip in green and chocolate for the shell features and eyes. It was one of my more unique cakes which was made at the last minute, but everyone was very happy with it – especially my nephew. Prepare the cake using any cake mix or cake recipe you want. You will need the following pans for the unique cakes: -Ball Cake Pan -Large muffin pan -mini muffin pan. 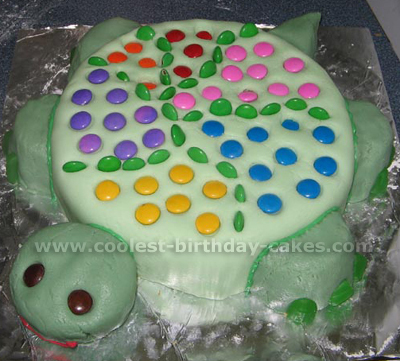 Make 1/2 ball per turtle (My ball cake pan is small so one turtle feeds only 5-6 people). Also make 1 large muffin per turtle and 4 mini muffins per turtle. Bake all cakes parts. Using a serrated knife (like a bread knife) cut off any overflow on the ball cake pans or any "tops" on the muffins." For each turtle use the large muffin top and cut a small triangle out of it for the tail. Frost all unique cakes with a crumb layer of frosting (any type you want). This can be messy. Roll out greet fondant to a thin layer and cover each cake part in the green fondant. 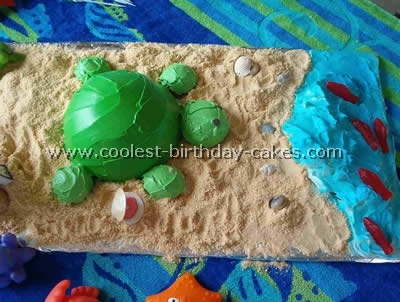 Assemble turtle on cake platter or board using frosting to hold the pieces to the board. Put 1/2 ball in center for body/shell, use large muffin (upside down for large the base) for the head mini muffins (also upside down), also for the legs and the triangle you cut for the tail. Color frosting dark brown or black and using the thin piping tip pip pattern onto shell (this is easiest to do before placing the other body parts). Then pipe claws onto feet. Use a blob of white frosting for the whites of the eyes and pipe a dot of the dark brown/black frosting in the middle of the eye. I used a food writer for the smile but you could pipe red frosting or use a piece of licorice. I used 12" and 14" oval pans, pillars and standard layered cake guidelines. The bottom two layers were frosted with buttercream and placed together. 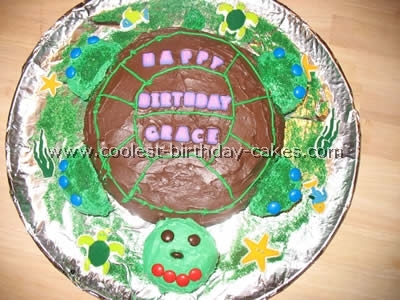 The turtle was made by using 1/2 of the Wilton Sport Ball pan and mini ball pans. The shell part was placed on a board and decorated. Then the head was made by putting two mini ball pans together and shaping it to resemble a turtle’s head. 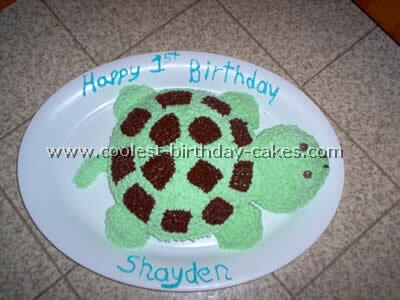 I built up white frosting on the top of the layered cake and placed the turtle’s head onto the cake by placing a straw into the head and then into the shell body and letting it rest on the built up icing. A frosted cupcake for the baby was secured to the top using a straw inserted into bottom of cupcake and top of shell. Tip #5 bead borders, tip #4 turtle and writing finished it off. I wish I had a picture of her face when she saw it but grandma forgot her camera in the hectic transport of the cake to the party. One of my girl friends has a collection of turtles and so I used this idea for her birthday. 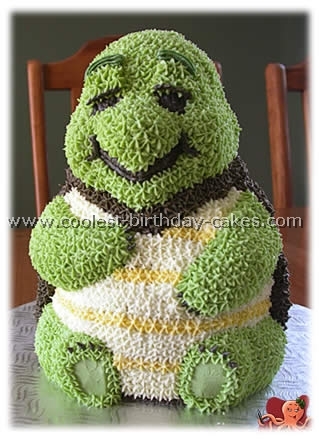 I used the Winnie The Pooh 3D cake mold for this turtle (you can make lots of unique cakes from one cake pan). I modified it a bit though with a knife and mostly for the carapace. 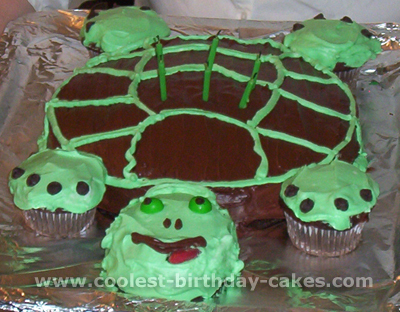 After having returned from a week in Georgia along the islands, my son was really interested in the Sea Turtles we had seen while in Georgia, so I decided to "surprise" him with a homemade cake (something I NEVER do, because I am by no means a creator or crafter! )., , Well, my 13-year-old stepdaughter and I created this cake out of half of a baseball cake pan, and five cupcakes. I baked a dozen cupcakes, using 5 for the head and legs, then the remainder made up the "wave" that the sea turtle was swimming out to, with red gummy fish swimming in the wave., , I made "sand" out of crushed vanilla wafers and saltine crackers (for a realistic mixed color look) and then took the shells we had gathered along the Georgia coastline, boiled them and placed them alongside the turtle! In one that was open like a clam, I put hot pink frosting and a candy cake topper pearl! I molded the "sand" into a "sand castle" and placed the #7 candle in that with a few drink umbrellas alongside. We decorated the room with beach towels for a tablecloth, a fish net with several fake squirty fish hanging off the light fixture, and various sand toys all about. We are beach people, so this year, when we return to Georgia, I think when I return, I may try one of these gator cakes (Okefenokee swamp!) for his surprise. I wasn’t very impressed with my decorating skills, but my son sure was. I am sure someone else can make the turtle idea a bit better than what I did, but maybe it is a starter idea for them! 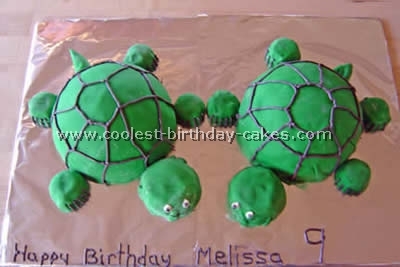 Use a 9" round cake pan for the body of the turtle. Make four extra cupcakes for the legs and head. 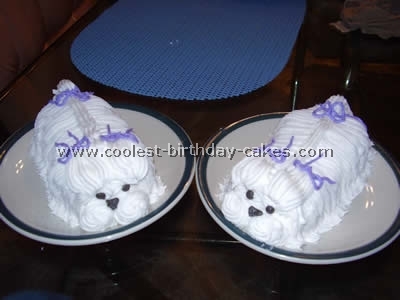 Bake and then cut two of the cupcakes in half for the four legs. Use one of the last two cupcakes for the head and cut a tail out of the last cupcake. (Unfortunately my husband accidentally ate our tail so we had to make one out of icing! 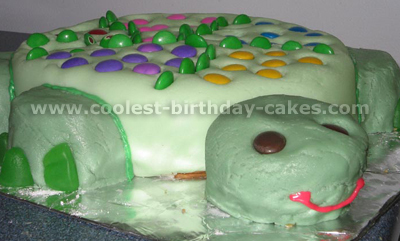 ), Use chocolate icing for the body and green icing for the feet, head and tail. Insert the body parts with toothpicks. Decorate with chocolate candies and sprinkles. Enjoy! I made this for a little girl’s 4th Birthday; she loves turtles. I sculpted out of three 9×13 cakes and then decorated with buttercream icing. A plain white cake mix was made by the box’s instructions. To 1/3 of the batter I added a couple drops of green food colouring and a few drops of peppermint extract. The two batters (the plain and the mint green) were then spooned into a round cake and muffin tins to give a swirled effect. 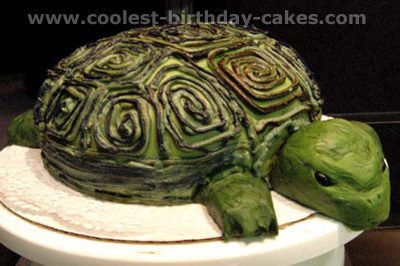 Once baked and cooled, the round cake was covered with a light green rolled buttercream (with a bit of mint extract) to make the body of the turtle. Two of the cupcakes were cut in half for the feet, one cut into a triangular shape for the tail, and one was left whole for the head; I made the buttercream for these a bit darker green (by adding more colour to the body’s icing). The eyes and shell were made from candy-coated chocolates and the toes from halved gummy candies; the line between the body and the feet/head/tail was ‘glued’ together by green tube decorating icing. I would have used green shoestring licorice on it had I found any. The only complaint was that the icing was too thick. 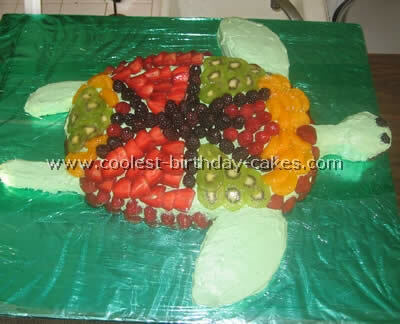 My daughter adores turtles and for her sixth birthday, she wanted to have a turtle theme birthday party! 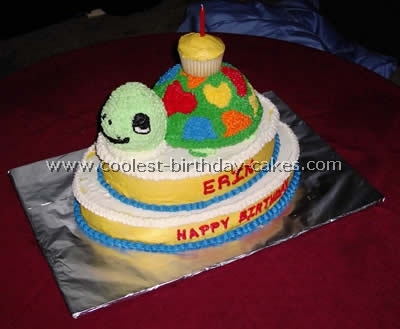 This cake is a 9-inch round cake with four cupcakes for the feet, and a larger custard cup size head. I iced it with a chocolate ganache and the head, feet, and shell pattern is green tinted whipped cream. The eyes are green M&Ms; tongue is a broken sucker, and toe-nails are mini chocolate chips. It was the best turtle I ever ate! 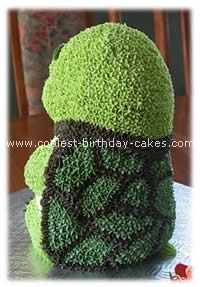 This is the turtle cake I made. It is done with buttercream icing with a bag stripping effect. I stripped the bag with black and brown, filled it with green icing and then piped it onto the shell. The head and neck I sculpted from fondant. I used a glass Pyrex bowl to make the shape of the cake look like a shell. 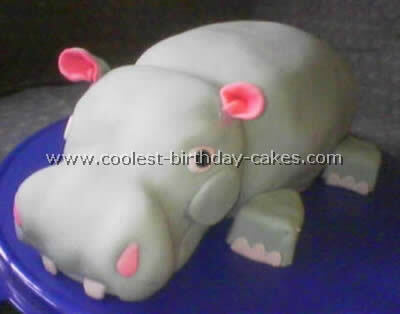 Head, legs, tail are all molded from fondant. The swirls on the shell were piped with butter cream.